Tranquility is the result of extensive consultation with some of the industry’s most knowledgeable specifiers of treatment space, along with facilities and caregiving staff in this specialized area. Its designed to create cancer and other treatment environments that are highly efficient and functional for caregivers to work in - but most of all, to make treatment for the patient as humane as possible. 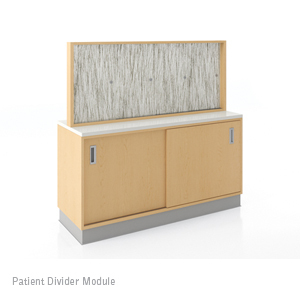 For oncology and other infusion spaces, as well as renal dialysis and other treatment areas, Tranquility is an evidence-based design that provides a highly efficient and functional work environment for the caregiver. But more than anything else, Tranquility is about the patient. Chemotherapy and other treatments require comfortable, restful, soothing and cheerful space - Tranquility has been thoughtfully and carefully designed to provide this, most importantly by giving the patient some control over their environment. Simple adjustments to the degree of privacy, easy access to entertainment options and personal effects, and the use of materials that evoke nature - all are integral elements of successful treatment and recovery.